260 million may just be a number, but for eagle eyed global investors this is the figure that makes for a lucrative market base, says Angelica Buan, in this report, after speaking to exhibitors at the recently concluded Indoplas/Indoprint show in Jakarta, Indonesia. Currently, one of the world’s most populous countries, Indonesia is also trekking the road to becoming the fourth largest economy by 2050, according to the Economist Intelligence Unit. The country’s 260-million population makes it a fertile investment ground, a common view held among exhibitors interviewed at Indoplas. The three-day show, jointly organised by Messe Düsseldorf Asia (MDA) and PT Wahana Kemalaniaga Makmur (Wakeni), housed 400 companies, representing 20 countries or 60% of exhibitors from the international market, with five national pavilions and groups from China, Germany, South Korea, Singapore, Taiwan, and Thailand. Of the industries demonstrating an uptrend, the Food and Beverage (F&B) sector maintains its trajectory. Statistic Indonesia (BPS) cites that soft drink sales are projected to reach a 9.3% CAGR from 2014-2018. Packaged food, fresh produce and ready-to-drink beverages are just a few of the items that will spur the demand for packaging, according to consulting firm CEKINDO. This year, the industry is projected to grow by 5-6% to over US$6 billion, according to the Indonesia Packaging Federation (IPF), owing to the country’s market size with improving purchasing power and growing F&B industry output, among other drivers. “Indonesia’s growth market is in multi packaging,” said Raymond Wong, Malaysia-based Area Sales Manager of Austrian recycling equipment firm NGR. 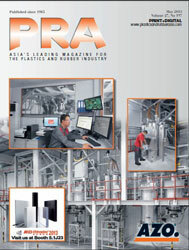 The 30-year old Rajoo offers not only extrusion but also thermoforming and pipe/profile machines. “Our machines are 100% made In India, but we collaborate with technical partners from the US (Commodore), Germany (Hosokawa Alpine) and Italy (Bausano),” Chokshi adds. Though the company supplies to over 60 countries, including Malaysia, Thailand, Vietnam, and Philippines, Chokshi relates that Rajoo has yet to firm up its presence in Indonesia. Meanwhile, Thailand, which some exhibitors are also placing on a rival footing with Indonesia as a lucrative investment spot in the region, is eyeing Indonesia not as a competitor but as a growth partner. Nevertheless, Indonesia needs to improve on other aspects to support its market potentials, such as power infrastructure and roads, to cite a few areas. Sriswasdi, who is also Managing Director of Chonburibased company Srithai Moulds is positive and opined that these challenges can be overcome over a ten-year period. The 400-member TDIA was represented at the show by eight firms, with participation supported by both the Thai government and the association, Sriswasdi said. An operating base to some 2,200 South Korean firms, Indonesia is an important market for South Korea, its fourth largest foreign investor and major consumer of oil, gas, coal and rubber. In the first quarter of 2016, South Korean Foreign Direct Investment (FDI) was valued at US$188 million. Almost 14 South Korean companies were at the show. 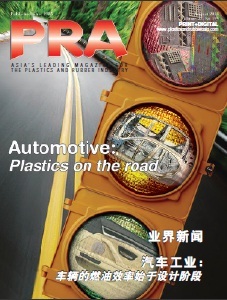 Growth in South Korea’s plastics industry has plateaued, and thus, the interest by exhibitors in markets in the region. Compounds/additives manufacturer Chemko was also a first time exhibitor at an Indonesian show. Company representative Sunwoo Lee said, “We see packaging as one of the most promising industries in Indonesia.” The Chungcheongnam-do-sited company has mostly focused on South Korea as well as Taiwan and China. “In Southeast Asia, Indonesia is the first market we are tapping,” Lee revealed. Meanwhile, the additives market is competitive since large global companies take a lion’s share, but Lee was confident the show would give the company the leverage it requires amidst a competitive scenario. “Venturing into the overseas market is competitive, but many opportunities are opening up,” Lee said. Germany has been a strong trade partner for Indonesia, with US$875 million worth of investments in the areas of energy, telecommunication, consumer, agribusiness, and industrial sectors in Indonesia. In the first quarter of this year alone, Indonesia secured US$20 billion investment commitments from European companies. The Indonesian trade show, which hosted the German pavilion comprising 21 companies, is a gateway for these companies, especially for mid-sized organisations that serve as the backbone of the country’s economy to expand their reach into overseas growth markets. German extrusion machinery exhibitor Windmöller & Hölscher (W&H) was promoting its Miraflex C for flexographic printing featuring a redesigned rear frame and tunnel, more robust printing decks and automatic cleaning of the impression cylinder; as well as Dynastar, a new-generation gravure printing machine for flexible packaging, specially developed for short and ultra-short print runs of under 3,000 m. A new feature is the changeable cylinder concept with slide-in carts, allowing for the possibility of making preparations for the next print job while the machine is still running. “The job changeover time is half that of the quick-change gravure printing presses commonly used today,” said Andrew Ettle, W&H Area Sales Manager (Gravure & Flexo Printing Machines). He also emphasised other features like print widths of 650/820 mm, a repeat print length range of 320-700 mm, and a speed of 300 m/minute, as well as 6 to 12 colour decks. 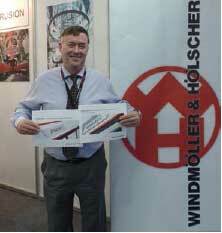 Another German extrusion machinery firm Hosokawa Alpine was promoting its new "X" die. Said Joachim Oberbauer, Head of Sales Division Asia, “It is the most technologically advanced die available on the market.” It was also promoting a five-layer blown film line for barrier films with PA and EVOH; MDO film orientation line featuring the patented TRIO (Trim Reduction Inline Orientation); and a turret winder that has reduced floor space requirements. Meanwhile, Europe’s largest machinery association VDMA made its presence at the exhibition covering plastics and rubber, paper and printing technology as well as industrial (plastics, foil, 3D, wood) and graphic printing (cotton and paper). Sven Breitung, from VDMA’s printing and paper division, commented: “Indonesia is a growing market whereas Germany’s growth is stable at the moment, with 1 to 2% growth every year. Likewise, the machine manufacturing sector right now is almost zero growth, so we are always looking for new markets.” Sven also pointed out that there are about 400 German companies related to VDMA’s sectors based in Indonesia. VDMA’s Sven says the packaging industry is a strong performing sector. “Indonesia has a young population, and this gives it a demand advantage.” Thus, VDMA is pushing other technologies for the packaging sector because graphic printing on paper like in magazines and newspapers is no longer a big market due to alternative online media. “Hence, we are rethinking as to how the entire industry can shift to a different direction. While we continue to print on packaging, packaging machines will be a main focus. Other technologies like 3D printing, organic and printed electronics, functional materials for OLEDs and lighting for displays, RFID tags and other electronic products are also taking their share of niche markets. Other focus sectors are energyefficient machinery and migration mechanisms, which deal with the “examination of mass exchange processes in the printing of rubber and polymer materials to ensure low-migration in food-grade production processes.” These innovations will bring benefits to markets like Indonesia, he said.